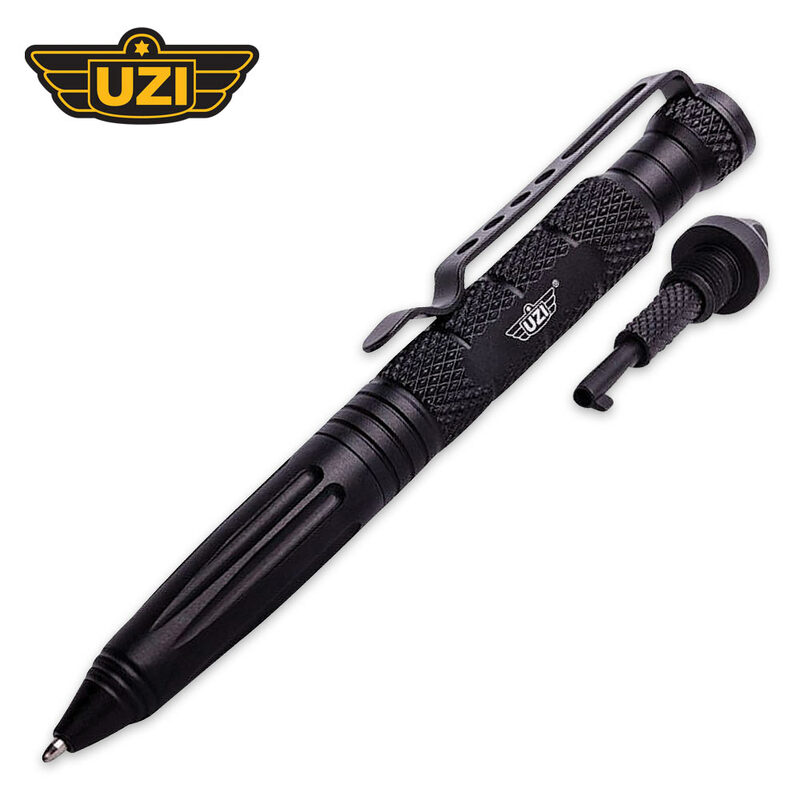 UZI Tactical Glass Breaker Pen Hidden Cuff Key | BUDK.com - Knives & Swords At The Lowest Prices! Continuing the UZI legacy, the tactical pen is often your last line of defense against an attacker. The Tactical Glass Breaker Pen Hidden Cuff Key is a black pen made of ultra-heavy-duty, lightweight aircraft aluminum with a metallic pocket clip and a slip-free grip. It features a carbide-tip glass breaker and a hidden hand-cuff key built right into the end of the pen. It is 6” in overall length. This really is a nice pen. Like with the other reviews it does write well, it's solid, and the glass breaker and handcuff key are nice features. The reason I am giving it 4 stars is the pen tip doesn't retract unless you unscrew the pen. When you unscrew the pen enough to hide the writing tip it becomes loose. Other than that very happy. Love this pen. It writes extremely well, has a rugged finish and feel. An effective weapon in a tight spot. I like the glass breaker and the hidden handcuff key as well. My only concern is that I have used it so long, the ink cartridge is empty. I don't know where to get refills. Hope CHK offers this item or directs me to where I can find one. All pens eventually run dry, no reason to affect the overall rating. 5 stars all day. I ordered the Pen,and it came earlier than said ,that was great ,and wow it was solid ,the pen writes great,and overall,I love it ,Cuff key works ,may need it as a back-up where I work,Thanks for the great fast service. Comfortable, hefty, writes good. Glass breaker/cheek breaker a nice feature. Didn't need the cuff key, but will treat it as a bonus.